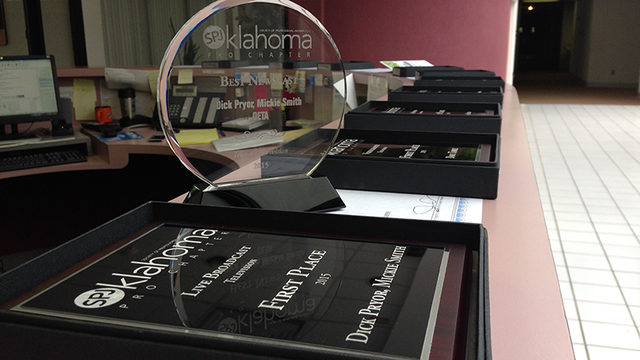 The Oklahoma Pro Chapter of the Society of Professional Journalists (SPJ) announced the 2015 winners at its annual awards ceremony on May 16, with OETA capturing numerous honors. Oklahoma’s only statewide PBS network won 11 first place SPJ awards, including BEST NEWSCAST (ONR), ELECTION REPORTING (Oklahoma Fourm), SPORTS REPORTING (Stateline), GOVERNMENT REPORTING and LIVE BROADCAST (Oklahoma Votes). OETA journalist Lis Exon also received special recognition as the broadcast winner of the Colby Award for her reporting on mental health. In addition to top honors in several content categories, OETA received four mentions for second place and five third place honors, totaling 20 awards overall. View the winning content online anytime at video.oeta.tv. The Oklahoma Society of Professional Journalists Professional Chapter supports working journalists across the state. The Oklahoma SPJ Pro Chapter works to advocate, educate and create opportunities for journalists. Learn more at okspj.com.